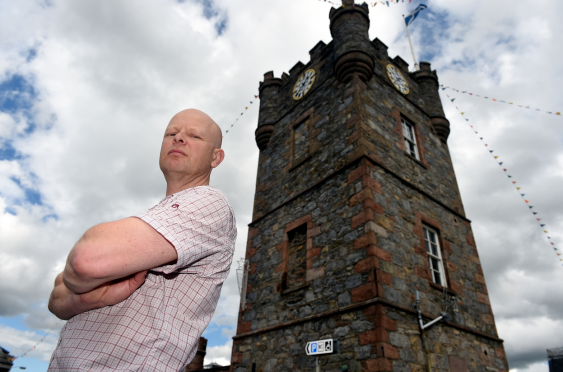 Dufftown business owner Alistair Jeffs next to the clock tower in the town, which will be dwarfed by the proposed electric poles. The Duke of Rothesay could help a group of Moray residents in their fight to protect the local landscape. Scottish Hydro Electric Transmission want to erect 78ft electric poles across the countryside to hook the 59-turbine Dorenell wind farm to the National Grid. The cables will stretch for over 14 miles from the Dorenell turbines to the Blackhillock substation near Keith. But Dufftown residents have united to fight the proposals, and claim the firm ignored their views when plotting the route. They are now preparing to lobby Prince Charles, MSPs, Moray Council and Historic Scotland, among others, to speak out about the development. Dufftown B&B owner Alistair Jeffs has previously urged the power firm to consider routing the cables underground, but does not believe it was ever properly considered. He said: “What’s the point in holding public exhibitions and putting all the boards up in the Memorial Hall just to come up with the cheapest option? That’s not consultation. “There’s no point making us all submit comments if it was always going to revert back to the original proposal. It’s a done deal. Last night a spokesman for SHE Transmission insisted the team had used the feedback from consultations to come up with a “balanced proposal” and stressed that was why they were proposing wooden poles, instead of pylons, to minimise the impact of the landscape. But Colin Mackenzie, who lives on the outskirts of Dufftown and will be less than a mile away from where the proposed poles will be built, remains unconvinced. Mr Mackenzie has prepared a dossier on the development and intends to start a lobbying campaign to urge people to object to the plans. Among his targets is the Duke of Rothesay, who took an interest in his family’s saw mill on Deeside after seeing it restored. Mr Mackenzie said: “There is a strong case for it to go underground. It’s all I can argue for, I know they won’t change the route. In the last two rounds of consultation, Mr Mackenzie said he had only noticed minor changes to the route that do reduce the impact of the cables. A spokesman for Scottish Hydro Electric Transmission said the firm had taken into account the views of locals while plotting the course for the poles and remains open to talking further with communities. He said: “The project has been discussed publicly since November 2014 and has been continuously developed through discussions and negotiations with affected stakeholders.